Regumate Equine is used to control oestrus ("heat") in mares. It is supplied as a liquid to be given directly into the mouth, or added to a small amount of food. It can be given daily to a mare early in her season and usually within 3 days it will stop that oestrus. Regumate can continue to be given once daily afterwards to prevent the return to oestrus. When daily dosing stops, 95% of mares will show signs of returning to oestrus within 5 days. 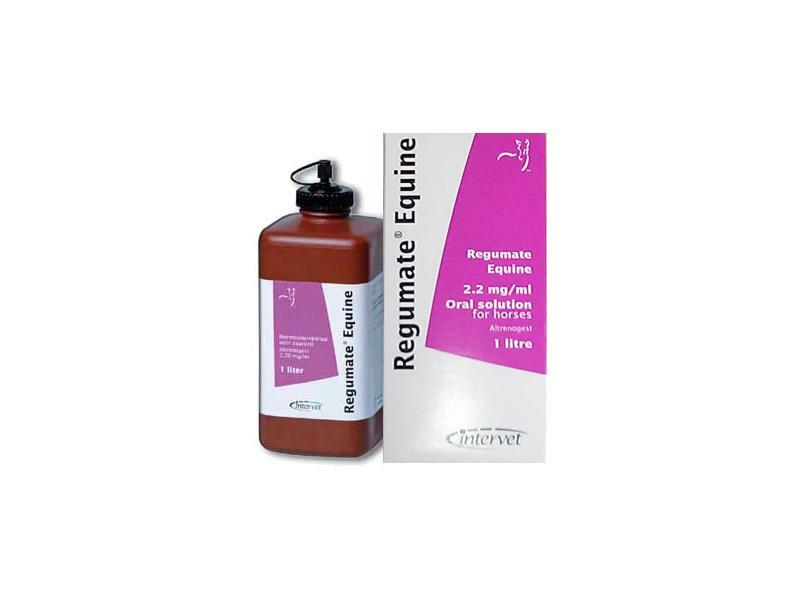 Regumate is usually used to prevent the hormone-dependant behavioural changes associated with oestrus, or to control the timing of ovulation so that the timing of mating and birth can be organised. Please Note: A syringe is not included with these products. For a syringe to take the fluid out of the bottle please click here. Oral Solution. Clear, light yellow oily solution. Do not use in mares where uterine infection has been diagnosed. Do not use in males. In order to ensure effective use of the product, the presence of follicular activity in mares must be confirmed during the transitional period. The medicated feed should be offered to mares being treated as soon as the product has been added, and not stored. Part consumed feed must be safely destroyed and not given to any other animal. Adverse reactions, such as uterine infection, are extremely rare. However, accidental administration is not detrimental as studies in mares have not produced any evidence of teratogenic, foetotoxic or maternotoxic effects. Use during lactation is unlikely to have detrimental effects. Griseofulvin may alter the effects of altrenogest if administered concomitantly with this product. 0.044 mg altrenogest per kg body weight per day, for 10 consecutive days. Carefully withdraw the volume of product corresponding to the mare body weight (1 ml per 50 kg body weight) and administer this volume via oral route. - 150, 300 and 1000 ml bottles: Wearing gloves remove the original cap and in its place screw on the luer lock cap. Keeping the bottle upright, screw the syringe onto the luer lock cap orifice, turn the bottle upside down, and carefully withdraw the solution from the bottle using the syringe. Turn the bottle right way up before detaching the syringe. Securely replace the small cap on the luer lock cap. - 250 ml bottles: Remove the white cap and the aluminium foil seal from the neck of the measuring compartment. Keeping the bottle upright, press the body of the bottle until the required volume of product is accumulated into the measuring compartment. Carefully pour the content of the measuring compartment on the mare feed. The product should be added to the mare’s feed, at a single feeding per day, or directly administered into the mouth using a syringe. No negative effects have been observed in horses following up to five times the recommended dose of altrenogest for 87 days and at the recommend dose for continuous periods up to 305 days. Meat and offal: 9 days. Not authorised for use in lactating animals producing milk for human consumption. (>20-25 mm) and therefore blocks oestrus or ovulation. During the second half of the treatment period with the product, when all large follicles have regressed, there is a peak in FSH concentration which initiates a new wave of follicular growth. End of treatment is followed by a steady rise in LH concentration, which sustains follicular growth and maturation. These endocrine effects ensure that most mares ovulate during the four day period between days 11 and 14 after the end of the treatment course. Altrenogest is rapidly absorbed following oral administration and can be detected in blood as soon as 10 minutes after dosing. Maximum serum concentrations are observed 2.5 hours following administration. Altrenogest is extensively metabolised in the liver. The terminal half-life following oral administration is 10.7 hours ± 4.3 hours. Altrenogest is eliminated both via urine and faeces, in similar proportions. Butylhydroxyanisole (E320), Butylhydroxytoluene (E321), Sorbic acid (E200), Benzyl alcohol, Triglyceride Medium chain. •150 ml bottle: 14 days. •250 ml, 300 ml and 1000 ml bottles: 28 days. This veterinary medicinal product does not require any special storage condition. The product is packaged in brown opaque 150, 250, 300 and 1000 ml polyethylene bottles sealed by an aluminium protective cap and closed by a plastic screwed-on stopper. The 150 ml, 300 ml and the 1000 ml bottles are provided with a luer lock cap which, when screwed on the bottle neck, allows the user to safely and accurately withdraw the product with a syringe that can directly adjust on the luer lock cap. The 250 ml bottle is equipped with a 12.5 measuring compartment. Part consumed feed must be safely destroyed and not given to any other animals. Below are some recent questions we've received regarding Regumate Equine for Horses, including answers from our team. Yes that is perfectly fine. You can order one bottle now then the remaining bottle in May. Just be aware that the prescription will expire after 6 months of the issue date though and we will not be able to dispense any remaining regumate off the prescription once 6 months has passed. But you can order the medication at anytime within the 6 month window so May is fine. I hope this helps. Regumate and Matrix contain the same active ingredients, but one is marketed for horses and one for pigs.